morning, March 28. It was consorting with a group of Red-breasted Mergansers on the lake side of the Fishhook Pier, but after a few minutes it flew to the very end of the pier where it remained until I left. 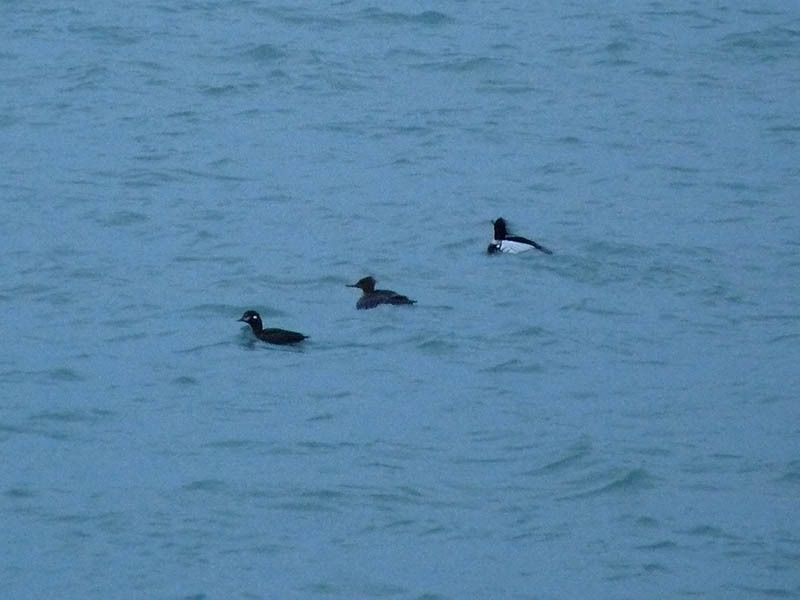 Harlequin Ducks are rare and irregular visitors to Montrose. BTW, the scientific name of Harlequin Duck, Histrionicus histrionicus, is an allusion to the boldly patterned plumage of the males. This entry was posted in Spring Bird Reports and tagged Harlequin Duck, Waterfowl on March 28, 2016 by rhughes. Western but I let it go. 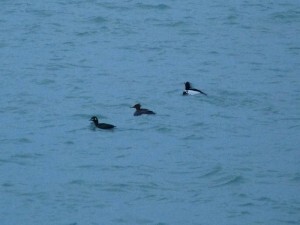 This entry was posted in Spring Bird Reports and tagged Best Spring Migration Days, Eared Grebe, Great Black-backed Gull, Grebes, Gulls, Loons, Red-throated Loon, Waterfowl, White-winged Scoter on March 19, 2016 by rhughes. I had a Short-eared Owl at Montrose this morning, March 16. I first saw the bird flying over the lake from the base of the Fishhook Pier around dawn. It circled back and landed for a couple minutes in the Dunes before getting up and flying around again. 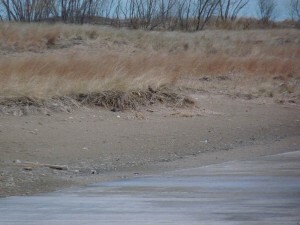 This is typical Short-eared Owl behavior at Montrose. I didn’t walk through the Dunes so I don’t know if the bird settled down or kept going. Short-eared Owls often show up on days with strong west winds, like today. This entry was posted in Spring Bird Reports and tagged Owls, Short-eared Owl on March 16, 2016 by rhughes. The birding wasn’t very good this morning but the fishing sure was. 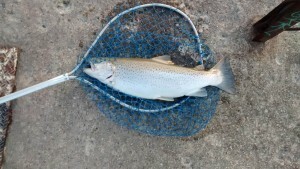 A lucky fellow caught this beautiful Brown Trout from the end of the Fishhook Pier just before I got there. Actually, I didn’t know it was a Brown Trout at the time but I did some research and Brown Trout is the best match (it turns out that fish identification can be just as difficult and challenging as bird identification). Brown Trout are native to Europe and Asia but have been introduced to many places around the world, including the Great Lakes. This one was about 2 feet long and 10-12 pounds. Oh yeah, I also had a first cycle Great Black-backed Gull, so the birding wasn’t a complete loss. This entry was posted in Other Wildlife, Spring Bird Reports and tagged Fish, Great Black-backed Gull, Gulls on March 11, 2016 by rhughes. I lugged my Questar out to Montrose this morning, hoping to see waterfowl and other things on the water or flying by. Lake Michigan was nice and flat and the visibility was good, but except for Red-breasted Mergansers, Common Goldeneye, and a few Horned Grebes I saw little. More interesting and unexpected were 2 Snow Buntings playing around on the Fishhook Pier. 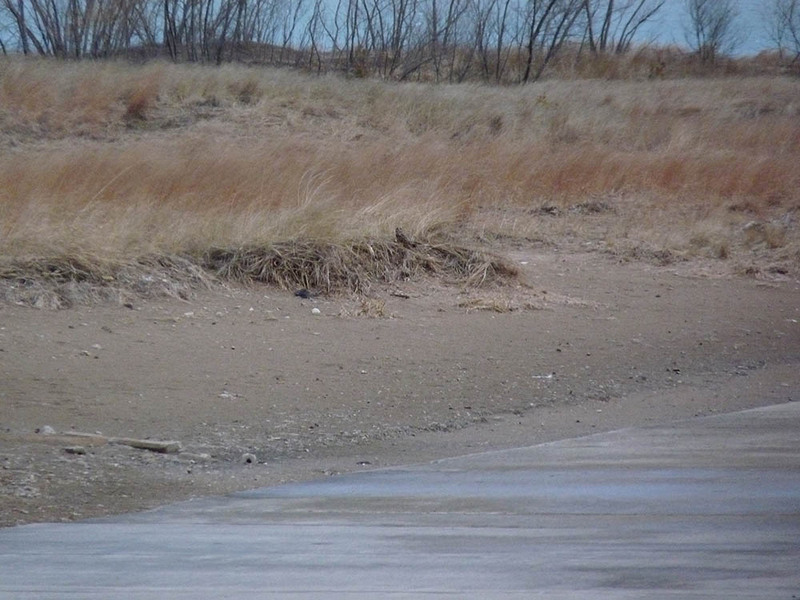 Snow Buntings are regular at Montrose from late fall to early winter but are less common in spring. I guess they have to go back north at some point. This entry was posted in Spring Bird Reports and tagged Longspurs, Snow Bunting on March 10, 2016 by rhughes. I walked to the end of the Fishhook Pier at Montrose this morning, March 9, to scan the lake for resting and flying waterfowl. There were a few flocks of Aythya going north, as well as a tight cluster of flying Green-winged Teal. Best and somewhat unexpected was an adult Common Loon in breeding dress boogying north. This is about 2 weeks earlier than I usually start seeing them along the lakefront. I didn’t spend a lot of time birding but I also saw several flocks of blackbirds going north, south and west. South winds in spring rock. This entry was posted in Spring Bird Reports and tagged Common Loon, Loons on March 9, 2016 by rhughes.